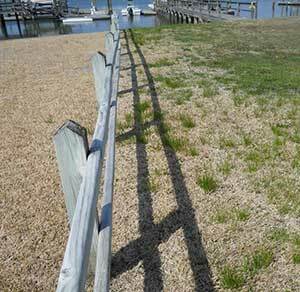 Cooler fall temperatures represent a battle cry to lawn care operators (LCOs) in the Southeast and the Transition Zone—it’s time to combat Poa annua. Also known as annual bluegrass, Poa annua is a winter annual weed that features wide leaves and grows in small clumps. Though there are perennial types of Poa annua, in warm-season grasses in the Transition Zone and southward, Poa acts more like a true annual, germinating in early fall and spring, when temperatures fall below 70. Once temperatures heat up in the summer, Poa annua dies off in warm-season turfgrasses, leaving behind unsightly brown voids. Each Poa annua plant can produce 6,000 seeds, which can remain viable for six years and spread rapidly in a lawn through mowing or watering. It’s also known for its seedheads that are light green or white in color—very distinctive in a green lawn. Bayer Green Solutions Team Manager Laurence Mudge says that because Poa annua can germinate at different times of the year and is genetically diverse and adaptable, it is a difficult weed to control. A common strategy for Poa control in lawns is spraying a single preemergent herbicide in the fall, according to Jim Brosnan, associate professor of weed science at the University of Tennessee. This application typically occurs from September to November. Brosnan warns that using only this strategy year in and year out can lead to strains of Poa becoming resistant to that product and its mode of action. He has seen resistance happen with dinitroaniline products, such as prodiamine, used in Barricade and other preemergent turf herbicides. Rotating herbicides, as well as their modes of action, is the key to preventing resistance, he explains. An alternative strategy is to do nothing in the fall and use a postemergent product such as glyphosate to control Poa later, says Brosnan. For example, some lawn care operators opt to apply a postemergent in the spring in combination with a preemergent application that will cover their customers for crabgrass season, as well. This year, Brosnan has been recommending mixed applications of a pre- and a postemergent with different modes of action—for example, something from the dinitroaniline class of chemicals (Barricade) with an ALS inhibitor such as foramsulfuron (Revolver). This mixture would be applied later, in mid-October to early November, rather than treating with a single preemergent in September only. In this strategy, the postemergent can kill off Poa plants that have already emerged, and the preemergent will protect against future emerging plants. “I’ve got a pre- and a post-, so two modes of action that are going to help me from a resistance standpoint, and I’ve started my program later, so now I’ve got a higher probability of getting to April Poa free,” Brosnan adds. Whatever your approach to controlling Poa, both Mudge and Brosnan encourage LCOs to speak with herbicide manufacturers and researchers to learn about the products they are spraying and formulate a plan to properly rotate herbicides. People often switch products and believe they’re avoiding resistance and keeping Poa at bay, Mudge says. “Poa is our No. 1 weed in the Southeast, along with crabgrass,” says Justin Brown, regional market leader of lawn care, Wayne’s Environmental Services. The Birmingham, Ala.-based company treats more than 2,000 acres, and Brown says it’s fighting Poa in all of that acreage. Wayne’s Environmental does over $30 million in revenue and provides 65 percent pest/termite control and 35 percent lawn care to a mainly residential clientele. Brown says that his company has found Specticle preemergent applications in the fall to be effective in fighting Poa. For spring preemergents, he rotates between dithiopyr (Dimension) and prodiamine products. Regarding postemergent products, Brown says that in warmer weather, Poa postemergent control is usually apparent within 14 to 21 days, and in colder temperatures, it takes possibly three to four weeks before yellowing is visible on the weeds. Depending on the time of year and the severity of the Poa annua population on a lawn, Brown says his company charges a cleanup fee and a one-year agreement to clear up extreme cases with postemergent products such as Celsius or Tribute Total. “It puts us on a level playing field, so we’re not incurring the cost of getting the lawn looking good and then (the customer) going to someone else,” Brown says. There are 252 species of weeds with reported herbicide resistance, including Poa annua, according to the International Survey of Herbicide Resistant Weeds. That’s why the experts agree that switching not only products but also modes of action is essential. If you suspect you’re dealing with herbicide resistance, Brosnan recommends sending in plant material to programs such as the University of Tennessee’s Weed Diagnostic Center. “The cost of doing that will certainly pay dividends in the long run to prevent failed applications from going out repeatedly,” he says. The University of Tennessee’s Turfgrass and Ornamental Weed Science program also offers online resources to help create a more diverse herbicide strategy and avoid an herbicide resistance problem. These tools include an herbicide resistance guide, which color-codes pre- and postemergent products according to modes of action, and a tool that allows turfgrass managers to select the herbicide they last applied from a dropdown menu. The tool then provides a list of pre-, pre-/post- and postemergent herbicides with alternative modes of action from that product. View these and other Poa control resources at TennesseeTurfgrassWeeds.org.